Hand tool woodworking is great. It’s relatively quiet, can be done with minimal shop space, and the results are often better than anything produced solely or mostly by machine. I consider myself a hand tool woodworker, although I admit sometimes I reach for a plunge router, cordless drill or an orbital sander. I also own, and frequently use, a thickness planer to surface the remaining two faces of a board that I’ve hand straightened and squared. Net net, if I’m deviating from my basic set of saws, chisels and planes, there are meaningful efficiencies at work. That having been said, I have a new addition to the shop. The Nobex Champion 180 miter box, with Ikeda blade. Perpetually on back-order at http://www.leevalley.com for a reason. I know it’s technically not a power tool, but it is also not an essential tool for hand tool woodworking. I can mark a knifewall and saw/shoot down to the line. I get it. I wanted the convenience and the speed of a precision miter box. Accurate saw cuts mean less time at the shooting board, so I can get back to the fun part, cutting joints. 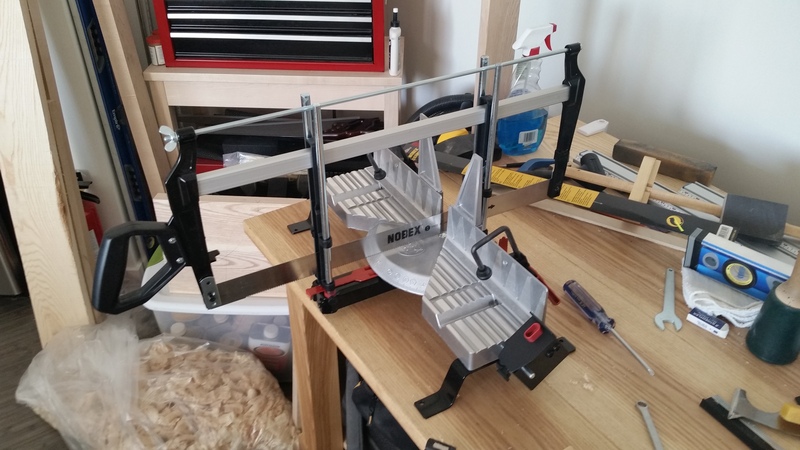 Plus, I miss my 14″ double bevel compound miter saw and this should be a pretty solid replacement. I have only cut a few pieces of wood so far, but I have some initial reactions. First, the unit was much easier to assemble than expected (although there were a few extra pieces [two random hex nuts], which is distressing). Second, the unit feels sturdy and the Ikeda blade is super sharp (already cut myself). Third, the blade should definitely be lubricated prior to use. My brother and sister-in-law requested that I make some footstools for their new house (they left the last footstool, which matched a vanity sink I also made, at their old house), so I will have an opportunity to further the miter box. I have also been thinking about making some picture frames; not out of necessity, but as practice for cutting mitered halflap joints by hand (which is a favorite design element in exposed joinery). Edit: After a couple days of use, I am very happy with the saw. I still have to shoot the ends of each board (the blade is ever so slightly canted to the left, which is probably user error), but it is always a slight cleanup, not a major straightening.